One of the great things about the Serverless Framework is that it can be used with multiple providers. We're up to seven (!) different providers with more on the way. 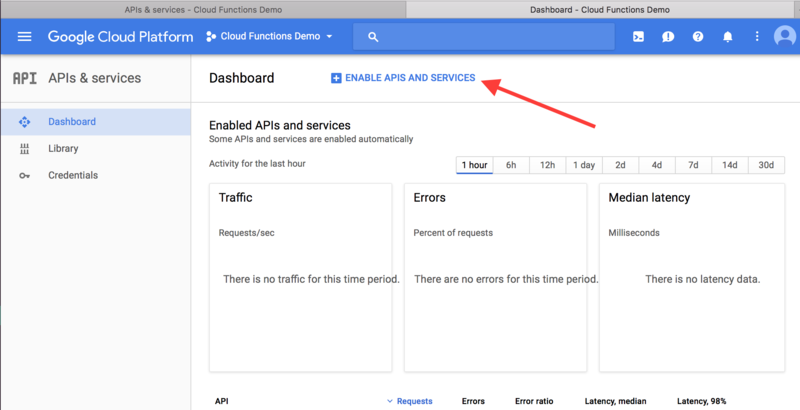 Today, I'm going to explore creating a project with Google Cloud Functions. Google has some great surrounding services in their cloud platform, so I'm excited to see the future of how they integrate their Serverless offerings. In this post, we'll deploy a simple HTTP endpoint to GCF to understand the development model. Then, we'll take it up a notch by using the Google Vision API to inspect images that we pass in. Finally, I'll cover what I'm excited about with Google Cloud Functions and what's needed in the future. Before we go anywhere, we'll need to get our account and credentials set up. If you've already done this, you can skip to Deploying a Simple Function. 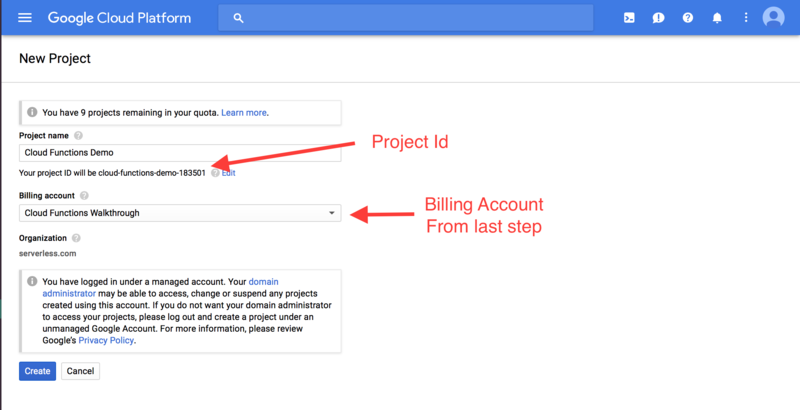 First, you'll need to sign up for a Google Cloud Billing Account. Follow the prompts, including entering your billing information. Next, you'll need to create a new project. Make sure you use the Billing Account created in the previous step as your Billing Account for this project. Also, take note of the Project Id which is listed on this screen. Once you have your project, you'll need to enable the required APIs. Navigate to the API Dashboard, and click the link to Enable APIs and Services. 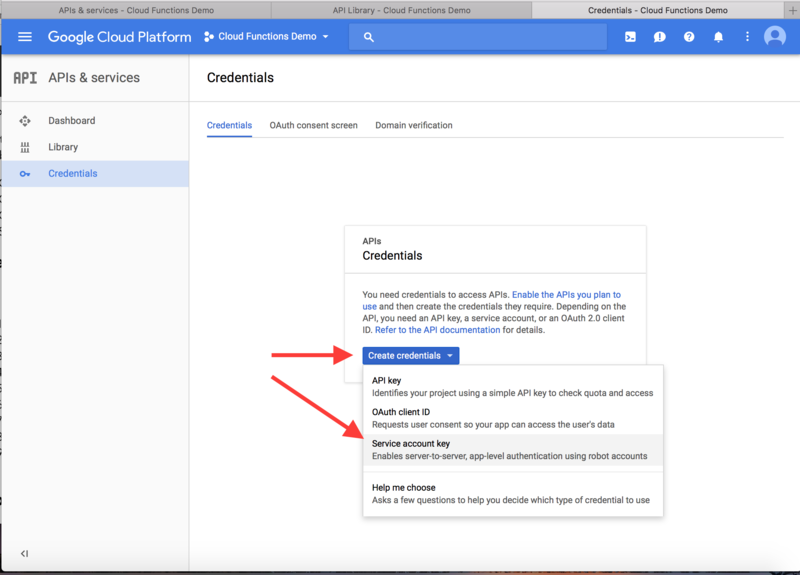 Search for "Google Cloud Functions", and click on the Google Cloud Functions API. Click Enable to enable it for your project. Then, do the same for the "Google Cloud Deployment Manager" API. Last step, we need to grab some credentials. Go to the Credentials page in the API Dashboard. Click the "Create credentials" button, and choose the "Service Account Key" option. When creating a service account key, choose to create a "New service account". Give it an account name. In the Role selector, choose "Project", then "Owner". This gives you full access in your project. It's more than you should use for production, but it will be easier for the quickstart. Finally, choose a JSON key type, then hit Create to download the credentials to your machine. Once the credentials are on your machine, move them to ~/.gcloud/keyfile.json. You'll need to refer to this path in your Serverless service. 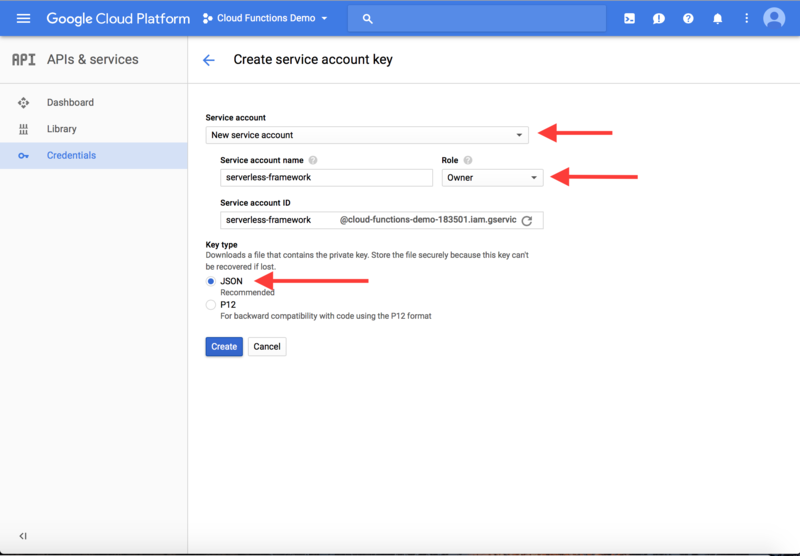 At this point, you should have a Google Cloud Platform credentials file located at ~/.gcloud/keyfile.json for a service account that has enabled the Google Cloud Functions API and the Google Cloud Deployment Manager API. You should also have a Project Id. If you don't have either of these, read the previous section. Now, open up the index.js file. You'll see two functions that are exported http and event. These represent the two types of triggers for Google Cloud Functions. An HTTP trigger is one triggered via an HTTP request to a particular URL, while an event trigger is one triggered from the various event source (Google Pub/Sub, Google Storage, or others). You can check the docs for additional information on the trigger types. The HTTP function signature is very similar to an Express.js handler -- there's a request object with information about the request, and a response object that you'll use to respond. For now, our function will just return `Hello World!' with a 200 status code. Note: You'll need to change the project value under the provider block so it matches your Project Id. If you don't know it, you can find it in the project_id key in your credentials file at ~/.gcloud/keyfile.json. This file is pretty simple. We're deploying a NodeJS function to Google under our project. There's a single function, http, whose handler is the exported http function in index.js. Finally, this will be invoked by an HTTP event at /http. Let's deploy our function and test it out! Run serverless deploy to send it up. Cool! We got our response back. Let's look at a few more things before moving on. The request object will have some useful properties just like a normal web request. This includes the HTTP verb (request.method), the request body (request.body), and query parameters (request.query). $ curl -G https://us-central1-cloud-func83501.cloudfunctions.net/http --data-urlencode "name=Alex" --data-urlencode "age=29"
Cool! We get some information about the execution, and we're also able to see anything we logged within function. In this case, we see the two parameters -- name and age -- in our HTTP request. With these basics in hand, it's time to move on to a more advanced example. Let's build something fun. Google Cloud Platform has the Google Vision API which can examine an image and provide details on what it contains. We're going to build an endpoint that takes in an image URI as a query parameter and returns a list of labels about the image's contents. First, we'll need to enable the Google Vision API for our project. Go back to the API Dashboard and click Enable APIs and Services. Find the Google Vision API and hit Enable. The response from the Vision API will include an array of labelAnnotations, which are general descriptions of what is in the image. We'll pull out the descriptions from those labels and return them in a JSON response to the client. Deploy your updated handler code with serverless deploy. Then, let's try it out with some images! $ curl -G https://us-central1-cloud-functions-demo-183501.cloudfunctions.net/http --data-urlencode "uri=$URI" | jq "." Neat! 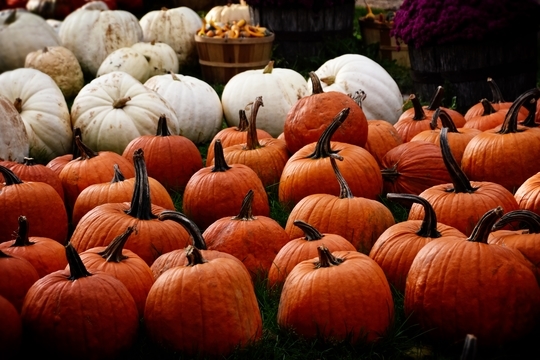 It knows that I've sent it some pumpkins. Sure enough -- it's a hot dog! I had a lot of fun building this. The Google Cloud Platform has a lot of interesting services, and I'm excited to see where the Cloud Functions product goes from here. In particular, I think Google Cloud Platform has some really great data stores for the Serverless world. Firebase was a groundbreaking product when it released a few years ago, and the new Firestore database looks like a great option -- NoSQL but with a more flexible query pattern, more similar to MongoDB than DynamoDB. For SQL lovers out there (like me! ), Cloud Spanner is an awesome, powerful product. Additionally, GCP has some great supporting services as well. The machine learning services like the Vision API and the Natural Language API. There are also some amazing data processing products like BigQuery, Cloud Dataflow, and Cloud Pub/Sub. A stable version. Cloud Functions are still in beta -- I'd like to see a stable release before relying on it for production services. More language runtimes. Python, please! 🐍. Right now, it's strictly Node.js. Better integrations with other services. On the AWS side, we're seeing more and more hooks from AWS services into Lambda. I'd like to see the same in Google. API Gateway. The GCF HTTP function feels like a single random endpoint for small demos. Contrast this with AWS, where endpoints feel more composed as a service. I can easily add custom domains to my Lambda endpoints and do HTTP validation and transformations before it hits my Lambda function. Excited to see where Cloud Functions goes from here!